It's time for the 2018 version of the annual Phish.net Jam of the Year (JOTY) competition! The seeding is done and the bracket is ready; this year, the four regions are named after the members of Kasvot Växt. The Horst region begins this week. The first four weeks will have eight matchups each (sixteen songs), while subsequent weeks will have four matchups or fewer, with the Jam of the Year decided by April. 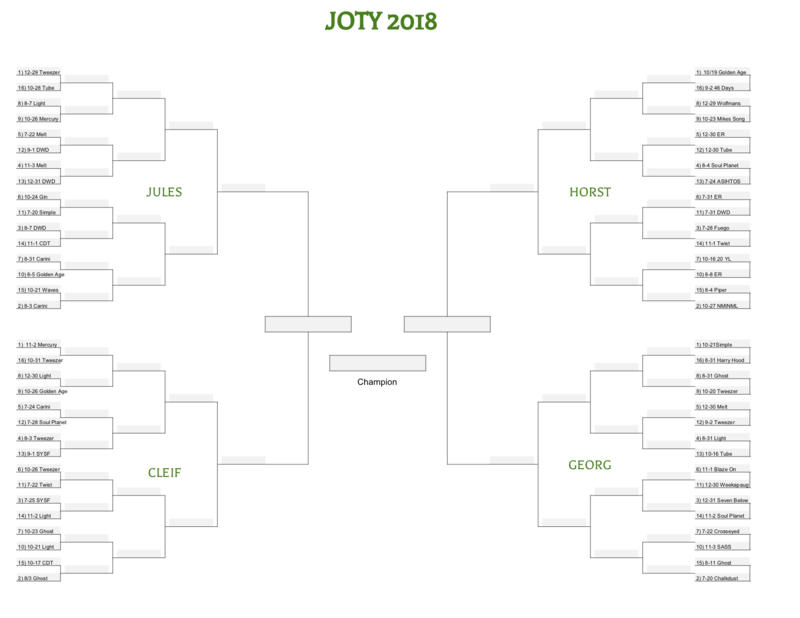 Voting will take place in the Phish.net forum in dedicated weekly "***Official*** JOTY" threads, like this one for the first round. Just post your favorites for each head-to-head matchup in the thread for that round, and the dedicated JOTY staff will tally everything up. Each round's winners will be announced in the following round's announcement. Voting for the first round closes at 5 pm ET, Monday, February 11th, 2019, but you may vote for a later round even if you missed an earlier round. You can find the first round match-ups and bracket after the jump. So excited for this. Last year's tourney made for such an incredible listening experience. Thanks so much to @easo91 and everyone else involved! I am shocked that my personal favorite JOTY -- the Gorge SOAMelt -- did not make the top 16! This was a fantastic year for Melts. The MSG Melt would also likely make my top 5 JOTYs. Both of them are clearly the #1 and #2 Melts of all time, IMHO. To each his own! A race for second place imo. 12-29 Tweezer for the win! I had to leave the pit during that jam because I was at serious risk of peeing my pants. But at least I heard the conclusion from the mid-hill portapotties. We’ll be going clockwise, so Georg is next. Right on. Thanks so much! I'm gonna go on the record and call the Vegas Mercury as the winner this year. 10-27 NMINML didn’t get a one seed? That is criminal. It delivered 25 minutes of beauty and bliss and then the dark funk at the end was simply extraordinary. A smooth segue into Steam topped of the jam of the year in my humble opinion. So, does the 12/29 Tweezer include the segue into DDHVL and back into Tweezer, or is it simply the first 19:55? Anyone know the rules on this?